When you are ready to start extracting and bottling your honey, here are some very useful and essential items. A 10" knife with a wooden handle and deep serrated blade. This electric knife has a thermostat and a control box. Tool used to pierce the caps unopened by the uncapping knife. This tool has a plastic handle. 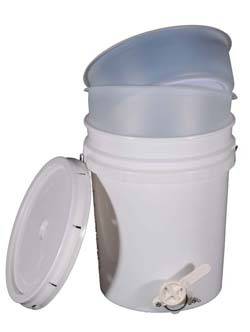 A great way to store honey, this bucket holds 5 gallons and comes with a snap on lid. We carry many different size and types of containers. Plastic - The 2 oz bears come with a screw cap and 12 oz and above include a flip top cap. All containers come with an inner seal. Glass - These jars are available in multiple sizes and all come with a white metal cap and inner seal.